Warning: In many countries, homemade stills are illegal. Check your local regulations before taking on this project. Stills can also be dangerous. This website or its creator accept no legal liability for the improper or illegal use of this design. The 5 gallon bucket still uses 2 buckets, one nested inside the other. The inner bucket holds the initial low-alcohol liquid and is heated to the boiling point of the alcohol by use of an immersion heater like this one. The alcohol evaporates and condenses on the top and side of the bucket. It collects in the bottom chamber where it is harvested. 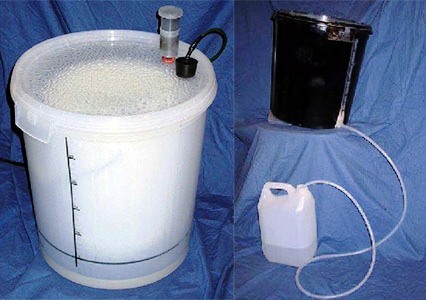 Some amateur brewers use simple stills like this one to produce fuel for their gasoline cars, which is legal if properly licensed. The best resource I know of for producing your own ethanol for fuel is www.iMakeMyGas.com. 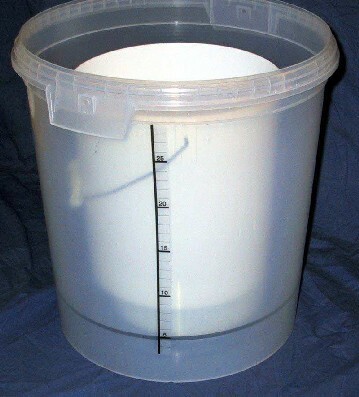 The full instructions for making the 5 gallon bucket still can be found on Prepper Ideas. The only downside of this design of still is there is no way to seperate heads, hearts and tails. The head is the first upto 200 ml of liquid depending on the amount of mash that is produced. This you dont want to drink as its methanol not ethanol. Methanol can lead to blindness and death. The hearts are mainly what you want in producing moonshine. But the tails collected in small batches one after another can be of some use. The tails are what will cause your shine to become cloudy. But they can be added back into your next batch of mash for redistilling. What I would recommend the 5 gallon bucket for in shine making would be for the fermentation of the mash followed by adding into whatever type of still you have. Me I use an old stainless steel preasure cooker that i moddified. Well hope this info helps out. Hmmm…I gues this must work or there would not be so many sites mentioning this. But, I don’t understand how it works. The heater runs at 45 to 50 degrees C, according to most articles. But, the boiling point of ethanol is 78.37 degrees C. It would appear that this ‘still’ runs too cold to work. The general modus operandum for a still is to heat it to a point below 78 for a while to flash off any methanol and other lighter fractions. Then heat to about 80 for distillation of the ethyl. I’ve done this using lab equipment and wine to recover the alcohol from a bad batch. Does anyone have actual hands-on experience with these bucket stills and what % ethanol are you making with it? They work very well considering its simplicity. I started my fascination with distilling by building one. I must admit, i did use 2 heaters but i checked my spirit with a hydrometer and it was apx 30-35%. My proper reflux still cobs out 94% spirit. The bucket still is a great way to make some ethanol with relative safety and minimal expense. Also, if you use brown sugar, you get a rummy tasting product. The heads and tails are not much of a problem due to the lower temps but running through a carbon filter will give you some perfectly acceptable product. Thanks for your comment Steve, I really admire your work actually. Let me know if I can make anything clearer or go into greater depth on this article. Listen to this man, he is speaking words of wisdom. water, sugar and yeast will never produce methanol. It will produce some esters that arent nice to taste in the heads and tails but thats all. It will NOT make you blind. Ever….. The most important thing to remember is that in its simplest form, distillation does not make anything new. It is simply a water removing process. If you distill a bottle of wine then any methanol in it will still be in the final product, but no more than existed in the first place. If you could drink the wine, then you can drink the brandy. As stated, sugar washes do not produce methanol, only fruit based ferments contain methanol. While this may be a late post to this thread, I also want to commend you on your contributions to dispel the myth of methanol. Methanol can sometimes be produced from distillation of fruits high in ester compounds, when apples decay esters are produced and bananas get their smell from esters. But as the author and Mr Harris state, even at maximum recovery, ~96% alcohol, the concentration of methanol would be miniscule. An ironic side note: The treatment for methanol poisoning is ethanol consumption. Seriously, The liver will process ethanol preferentially to methanol, allowing methanol to be excreted in urine. So even if your moonshine contains methanol, the remedy will be consumed simultaneously, and at at a much greater concentration. I use a counter top water distiller. I always do two distillations. It takes a long time because of the small capacity of the still. I want to use the plastic bucket still to do the first distillation. Then use the water distiller for the second. I already have the parts, except the heater, to build it. This would be a great convenience if it works.